January 19, 2013 was a beautiful, balmy Saturday, ideal for some camera time out in nature. So, my fiancé and I headed out to Beaver Creek, located in the Verde Valley, Arizona. Beaver Creek is nestled between the mountains and sunset was approaching. I carefully hurried down the embankment to set up the new camera equipment that I did not want to end up with in the middle of the creek. I was particularly excited to try out this “professional” camera, which has oodles of bells and whistles, including an ISO range of 100-25600! It is the new Canon EOS 5D Mark III 22 megapixel camera! Fully programed, the camera does all kinds of wonderful things, automatically, including adding copyright information to the metadata.It has so many more functions than my previous Canon Rebel XSi, such as new control types situated in different locations on the camera. I have so much to learn, so many new techniques to practice! Beaver Creek’s water level is not deep in January; however, the water flows rapidly down the mountain and here and there little waterfalls gurgle and bubble. I captured Reflection just above one of those waterfalls. I attempted several different angles and perspectives prior to achieving the effect of this image. As I looked down into the flowing water and realized I could see the small rocks through the water into the creek bed, I smiled in anticipation of capturing them with the Mark III. I do! Among the thousands of photographs, I have taken, only a few evoke the feelings that this one does. Every time I look at the photograph, I feel the peacefulness of that day. I hear the babbling waterfall. I breathe the fresh clean air and feel the cool breeze on my skin. 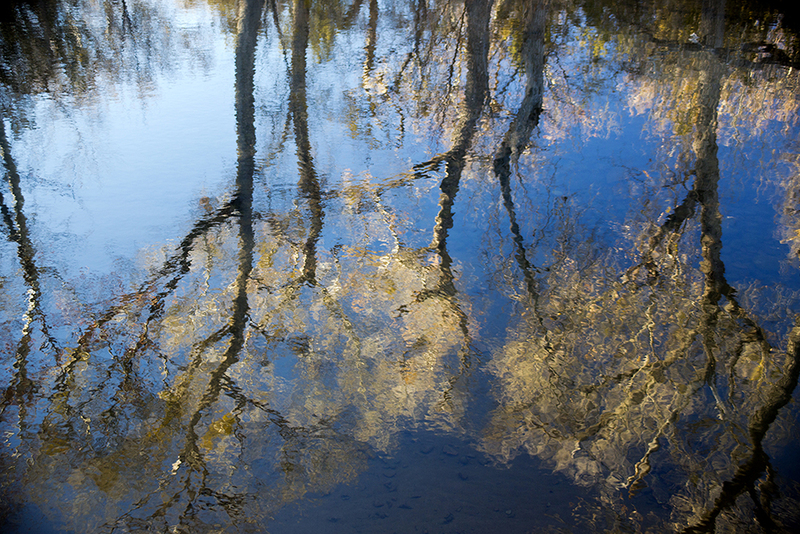 The movement of the flowing water created the surreal effect of the reflected trees and the deepening of the afternoon sky provides the rich blueness of the water. The photograph reminds me of an impressionist painting and, after all these years, I finally see what inspires the impressionists. I have a new found appreciation of their work. I look forward to reliving this moment in time, this feeling, and this revelation every time I look at the photograph. I feel a sense of peaceful, grateful anticipation. Born Margaret Whittaker in St. Jerome, Quebec, Canada 61 years ago, my first camera was a Brownie camera given to me by my father who gave me suggestions about subjects and lighting. Over the years, I had various point and shoot cameras. I purchased my first SLR camera and took a couple of community college classes. Professors commented that I have an eye for composition. Photographing is a joy, however, when co-workers saw my photographs, they encouraged me to create greeting cards. Sales of greeting cards and prints, reorder requests and queries about whether I took family, wedding and portrait photographs, prompted me to pursue those revenue sources. Co-workers joked that I already had a part time retirement income figured out. In the spring of 2007, “Hunter,” a photograph of a tiger from Out of Africa Wildlife Park in Camp Verde, Arizona was one of over 500 entries at the International Photographers Society Convention in Las Vegas. “Hunter” won second place and I took home a $2,500 check. God’s artistry is the inspiration. The challenge is to capture with the camera what God has created. A major in Photography enables maximum utilization of the camera; perception of the world in new ways; unique capture of moments in time; and the ability to share God’s creation with everyone else. Visit my website at MIWhittakerPhotos.com.